US, 1997, 100 minutes, Colour. 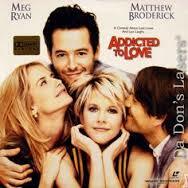 Meg Ryan, Matthew Broderick, Kelly Preston, Tcheky Karyo, Maureen Stapleton. A 90s variation on the screwball romantic comedies of the past with Matthew Broderick abandoned by his girlfriend, Kelly Preston, taking up with Tcheky Karyo who, in turn, has abandoned his girlfriend, Meg Ryan, who was to help him get a green card. Matthew and Meg meet in a conveniently abandoned building opposite the lovers, set up a surveillance system and set out to torment them. This gives a somewhat nasty edge to the comedy, especially with Meg Ryan trying a touch of Mad Max tactics. A bit hard to get really interested in the goings on or to feel much sympathy with them. The was directed by actor, Griffin Dunne. 1. A romantic comedy? Black romantic comedy? 2. The charm or not in the romance? The credibility of the relationships between the couples? 3. New York City, apartments, streets, restaurants? The musical score? 4. The romantic introduction: Sam and his work in astronomy, his talents, predictions, meticulous detail? The telescope looking at Linda? Her waving? Working with the children, her planning to go to New York, her declarations of love, his not wanting her to go, her leaving? 5. Sam, Linda’s father, reading out her letter about the breakup? His being upset, going to New York, tracking down Linda? 6. Linda and Anton, in the apartment, the relationship, sexual relationship, the discussions, their being spied on? 7. Maggie, her arrival, dressed in black – the Mad Max touch? Her manner, abrupt, intrusive? Her wanting to spy on Anton? The story, in France, the relationship, fiancee, his getting the green card, the breakup? Her anger, spite? 8. Sam, setting up in the abandoned warehouse? The camera, the telescope? His reaction to Maggie, against her? The discussions, her winning him over, setting up the elaborate sight and sound surveillance? 9. Anton, his past, as a model, poor, coming to America, his speech about how wonderful America was? His restaurant, his talent in cooking? Cooking at home, using the same words to Linda as he used to Maggie? Sam appreciating his cooking? His affair with the financier and his confession? 10. Maggie and Sam and their attack? Bumping into Anton on the street and taking his credit card and using it? The scene with the monkey on Anton’s shoulder? Bribing the kids to spray perfume on Anton? His telling Linda, her reactions, laughing? Maggie and Sam dismayed? 11. Theor going to the apartment, moving things around, the sexual encounter, its meaning, their imagining the others? 12. Sam, going to the restaurant, applying for a job, tidying the flower vase as Anton would? His being hired, the hard work? Discussions with Anton, listening to his story? Anton recognising him, yet praising his strong stance? Sam going to the apartment, Maggie watching? 13. The cockroaches in the restaurant, Anton being ruined? Linda walking out? His complete devastation, and the rash from the strawberries, his itch, Sam thinking Anton was going to be run over by Maggie and pushing him over the fence and his being in a cast? Relying on Sam, inviting him to stay? 14. Sam, meeting Linda, happy? Her confession that she did not know what she was doing? Seeing the monkey in the park? 15. Sam, realising he loved Maggie and that she loved him, despite her manner? How credible this relationship? 16. Linda and Anton? Sam and Maggie? Maggie’s mother, the photos, mistaking him for Anton? The photos on the plane? 17. Sam’s return – and the happy ending? Possibly?